FINALLY! “Fried” rice you can love without the self-loathing! Although baked fried rice takes longer than fried fried rice, it’s not any more work–in fact, it’s probably a little bit less. And you end up with that perfect fried rice texture and taste in a healthier package! 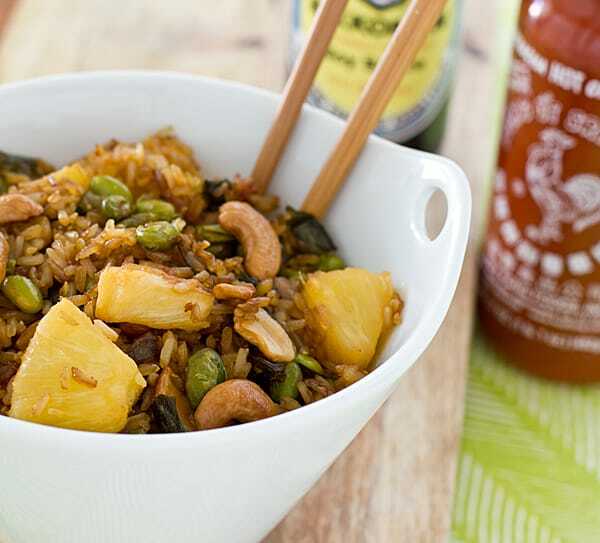 Combine rice, green onions, pineapple, edamame, and cashews in a large bowl. In a small bowl, whisk together oil, soy sauce, and sriracha. Pour oil mixture over rice mixture and stir until well-combined. Spray a rimmed baking sheet with oil or cooking spray. Pour rice onto sheet in an even layer. Bake for 45-60 minutes, stirring about every 20 minutes, or until rice is dry and just beginning to get crispy. Serve with additional soy sauce and sriracha, if desired. The rice I used for this was 2 days old. Thank you! And I hope you like the recipes you try! 😀 This one is probably my favorite from all of last year. This looks amazing and totally do-able! I’m making this!! Thanks ill return and let you know how it went! I may add a tiny bit of sesame oil just at the end of the baking time. I made this for my family tonight and they loved it. My husband thought is was fantastic and is looking forward to work tomorrow so he can have leftovers for lunch. The only thing I did differently was add broccoli and asparagus instead of soy, since we don’t eat that. I also cooked my rice (brown & black ) in veggie broth. It was fabulous, thank you. Made this last night and it was awesome! The rice had that perfect, crispy fried rice texture and the pineapple/cashew/edamame combo was a fantastic mingling of flavors. Oh, and it was like the easiest ever weeknight dinner to prepare. Thanks so much! This turned out so well! Thanks for a unique recipe. I added 3T of orange juice to the wet mixture. I just wanted to thank you for this recipe. I have made it maybe half a dozen times. When I have them handy or remember to buy them I add mung bean sprouts while the rice is still hot. Adds a bit of moisture and even more texture. Either way this recipe is really good! Thanks again! Yay, I’m so glad you like it enough to make it that many times! 😀 I’m going to have to throw in some bean sprouts next time I make it. This is so good! I will admit to altering it a bit (I used mushrooms & carrots & no nuts) but I did the rest the same (oh & canned pineapple in pineapple juice is wonderful). I just love this recipe!!! Soooooo good! This is such a great recipe! I work in a restaurant and one of the cooks made this a few months ago. I couldn’t stop snagging pieces of fantasticly chewy/crispy rice. I’m making it for supper tonight, with a few variations (gluten-free soy sauce and different veggies … And three times the amount of sriracha) and it smells amazing!! I can’t wait to eat it. Thanks! I have everything on hand to make this, and I am positive I am going to love it, tonight’s the night. Thank you for the recipe . I can’t wait to try it tomorrow. What is srirachi? I am sure I will be able to find it because I am only a short distance from Chinatown in Chicago. I am excited! Could I substitute something for the edemone (green bean)? I am sure my son won’t eat them. He is 31 and is just now starting to develop food allergies, especially lettuce and broccoli. I know he is not making this up because I have seen him when he eats those things. Funny thing is that most of the stuff he is allergic to is green and so I know he won’t take a chance with the rice, even though he could just take them out, he gets scared. Sriracha is a sweet hot sauce. Most regular grocery stores sell it, so you shouldn’t have to go to Chinatown for it. 🙂 I know people have added mushrooms, carrots, and other veggies to this recipe, so you can substitute whatever your son can eat for the edamame. I’ve made this recipe several times – though the ingredients vary each time. Thank you so much for this versatile recipe! I usually use Alton Brown’s recipe for baked brown rice, usually doubling the recipe for meals throughout the week. Your recipe is my favorite use of his brown rice. I like to add butternut squash to your recipe and whatever leftovers I need to get rid of. This recipe never disappoints. Thanks! I love this idea!! I used quinoa instead and no pineapple as my husband does not care for it. I added broccoli and juice of half of an orange. It is really good. It is probably my favorite Pintetest recipe ever! 🙂 thanks for the inspiration! I tried this recipe for the first time a week and a half ago and my family loved it. I now double it and have made it three times already. They never complain that I am feeding it too them too much and it is so easy to make. This was an absolutely wonderful recipe! great idea to bake all the ingredients together. Next time I make it I want to try scrambling a few eggs and mixing it in for the last 15 minutes of baking. The variations you can introduce are endless – when I have a few too many veggie and rice left-overs, it’s time to make this again. I’m glad you enjoyed it! I’ve heard from people who’ve made this so many different ways–it really is versatile! Ohhhh … you definitely doubted yourself for no reason here! I’m going to have a go at this sometime very soon … I’ll try to remember to let you know what I thought when I do. Brilliant idea … plus bonus that you can shove it in the oven and pretty much forget about it until it’s done! Cooked this for dinner and it was wonderful. It was the perfect end of week dish to clean out the veggie drawer… a little of broccoli, onions, asparagus , and zucchini. I’m glad you enjoyed the recipe–thanks for your comment! Made this for dinner tonight with cauliflower ‘rice’ (1/2 a cauliflowers worth) instead of brown rice and it worked out so well that there were no leftovers. I spread it over 2 cookie trays and cooked at 200*C for 30 minutes, stirring every 10. Also in the mix was corn, chili, green beans, peas, spring onions, cashews and 1tbs grated ginger. Thanks so much for posting this recipe, I would never have thought to oven bake fried rice or fried ‘rice’. Yes, it’s the perfect way to use all all those stray vegetables that tend to accumulate in the crisper! 🙂 I’m going to have to try adding wild rice! Thanks for this recipe, it’s one of the easiest stress free dinners on earth but no less delicious than normal fried rice. Love it. Hi, technical question. Do you mean one whole green onion plant, or the variable 5 or 6 that you buy as a bunch? Looks great, am cooking it now, with one onion. Just loved this. So wonderful. We used a ton of veggies (mushrooms, peppers, cabbage–as well as your recommendations) and leftover rice from Chinese takeout (so, white) and it still had the lovely crunch and flavor. Thanks so much! It’s a keeper! Loving oh my veggies since we went totally vegetarian a couple of weeks ago, you have been a total life saver. This is so wonderful. I lived downstairs in my daughter/son-in-laws house. I have a mini-kitchen with a full size frig, microwave, slow cooker and a Foreman grill. For Christmas, they gave me a table-top convection oven, so I’m expanding my meal opportunities. Fried rice can get expensive to order so I love the idea of being able to make my own. Thank you.